As this fuel has gained popularity amongst drivers, we have found the need for an affordable yet consistent formulation of fuel ethanol. As you may know, E85 at any given retail outlet is not necessarily the same percentage of ethanol. Nor is it guaranteed to be the same from batch to batch. We have seen the ethanol percentage in E85 range from 71% to 86%. Racers would prefer to acquire a consistent formulation if possible. 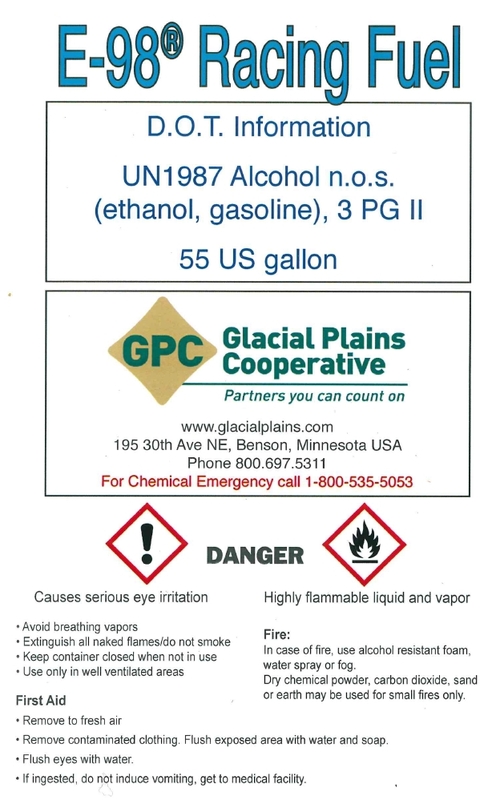 Glacial Plains Cooperative has blended, drummed and distributed E-98 Racing fuel since 2003. We work with CVEC, a local ethanol plant to provide a consistent blend of E-98 to meet your performance needs. There are still racers who get E-85 from the gas station pumps and find that the percent of alcohol changes on a regular basis. We blend our E-98 Racing fuel so that you can dyno your motor with one of our drums and will receive the exact same product in every drum you receive from us. We have shipped product all over the country to car manufacturers, fuel pump builders, and motor builders, as well as for drag racers and modified race car drivers. Ethanol runs cooler, gives off less polluting emissions and is safer for those handling the product. Just read the Material Safety Data Sheet for your current fuel and note the amount of toxic products in your race fuel. We have wholesale and retail pricing available. Give Joel a call at (800) 697-5311 to find out how E-98 Racing fuel can help put you in the winners circle.